Home What Does Your Resume Say About You? Think of your resume as an investment. Are you dreaming of that next opportunity? Is your resume as amazing as the job you’re dreaming of? If not, it’s time for you to take it up a notch, or two. Your resume is a way of conveying not only your skills and experience, but also who you are as a person. Therefore, a resume is important in securing that next step in your career. You only get one chance to make a first impression. Did you know many job applicants don’t make it past the first step because their resume is not effectively communicating the right information? Don’t fret, these mistakes are fairly easy to correct. 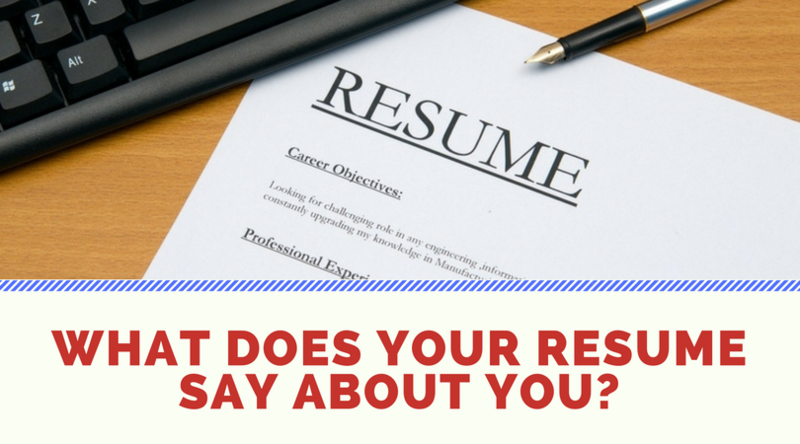 So let’s take a look at what your resume says about you! A resume littered with typos and grammatical errors immediately makes you stand out, and not in a good way. In this day and age, Microsoft experience is expected. It’s hard for hiring managers to believe you are proficient in this department if your structuring is all over the place, or even inconsistent. There is no excuse for those types of mistakes and a hiring manager will knock you out of consideration immediately. A fresh set of eyes, paid or otherwise, can help you find mistakes as well as experience you may have missed and allow you to correct them. The end result is a resume worthy of that next dream job. Adding too much information, or fluff, will not bring you that much closer to your Dream Job. Your resume should detail the level of experience you have amassed over the course of your career. However, this alone is not enough and it is here that many candidates fail. You need to stand out and showcase how your past experience is relevant to the position you are applying for. This will show your potential employer that your experience and skills can add value to their company. Is That A Summary, or Job Description? Did you know only one third of your resume is actually reviewed? That’s right! Many resumes are scanned over, and only if something catches their eye will they truly look over it with a fine tooth comb. So keep it short and sweet. The average resume should be no longer than two pages, but many applicants feel the need to expand on this and often submit resumes which are well over four pages. You may feel that you have a lot to offer, but employers are looking for something more succinct. A professional and concise resume, delivered within two pages, will show that you can focus on what’s really important. Many organizations have a mission statement, describing their approach to not only customers, but their employees too. It is this essence that you need to incorporate into your resume, to show that you have the background and mind-set required for the company’s culture. It is not difficult to research this information, just head to any organization’s website to learn more about their culture through their Mission and Vision statements. All too often, resumes can feel too generic by not carrying out research, so make sure you don’t fall into this trap. Certain items are best left off your resume as they can not only paint you in a bad light, but they can also intimidate the person reading your resume. So, for example, if you hold a membership of a political party, it may not sit entirely well with the organization you’re applying for. A resume is something that is going to be read by a complete stranger, therefore you don’t want to appear guarded, you need to understand that hobbies and personal views are best left off a resume. Remember your resume is your 30 second highlight reel, you want to ensure you are giving the best possible first impression, to land the job! Need to update your resume? Don’t waste your time sending out an ineffective, less-than-competitive resume! Let a skilled writer handle your future career! Save time! Get Hired! Email Admin@SynergyMR.com for a FREE resume evaluation!